Reefill wants you to subscribe to drink New York City tap water. Like Uber, but for drinking tap water. 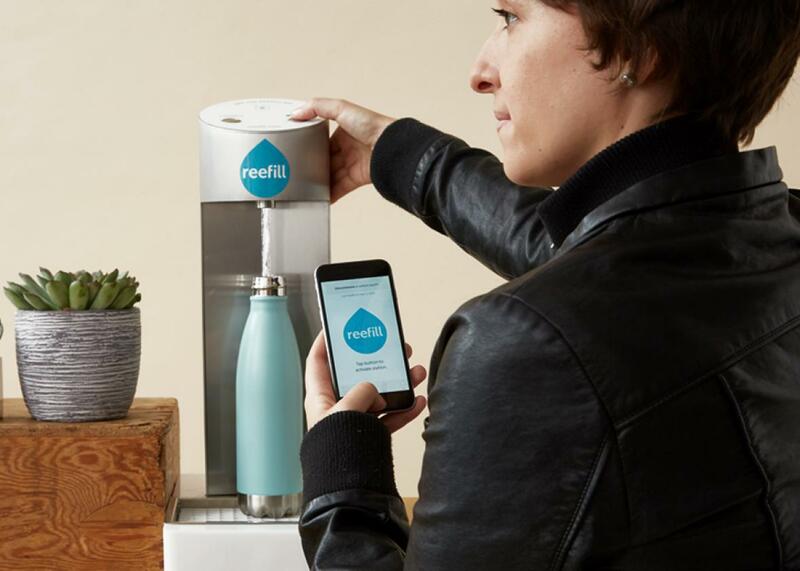 That is the concept behind Reefill, a startup that aims to bring the subscription model to the simple, free act of filling up a water bottle at a café. The company wants to build 200 smartphone-activated water fountains inside Manhattan businesses, less to make money off the Nalgene crowd than to hit Dasani, Aquafina, and the wasteful consumption habits of bottled water–guzzling Gothamites. “It’s almost like smoking,” co-founder Patrick Connorton says of Americans’ love for bottled water. “We want to change behaviors. People’s needs are not being met.” Subscribers get a reusable, foldable plastic bottle that looks like a tall, white Capri Sun with a cap. On Monday, I met Connorton and co-founder Jason Pessel, who had the idea for Reefill during a thirsty moment in Manhattan, at a crowded downtown café. “Living in Manhattan, there’s no place to get a drink of water,” Pessel says, adding a gripe I hadn’t heard before to the long list of irritating things about life in New York City. Water, water everywhere, but you have to ask a barista to fill up your bottle. The Reefill, which looks like a large SodaStream, stood at the end of the counter. There weren’t any subscribers around, but the cashier used a hidden button to unlock the Reefill when I asked for a glass of water. I pressed a button, water came out. Tasted like water. Other customers hesitated by the contraption, bemused. A paying subscriber would use the Reefill app to locate this station, then activate the machine from his phone using Bluetooth. The pitch to cafés is free installation, extra foot traffic, and a no-maintenance water pitcher. Such is America that public drinking water, like so much else we once thought would be free and available to everyone, is now a Bluetooth-activated subscription service. Two dollars a month is a sizable markup from the penny-per-gallon water costs from the tap. Hearing Connorton and Pessel describe the awkwardness and angst of carrying and filling a water bottle, the lukewarm pitchers and the awkward looks, I thought of the grainy black-and-white infomercial footage where actors make hard work of straining spaghetti or curling up with a blanket. The enlightened among us who already drink tap water aren’t Reefill’s customer base. The real targets are the New Yorkers who have helped send U.S. spending on bottled water north of $12 billion a year. In 2016, for the first time, Americans bought more bottled water by volume than soda. That’s why, despite its founders’ proclivity for tap water, Reefill stations run the water they pipe from the city’s system through several more filters. It’s tap water in a suit. Then again, it’s hard not to look at both a “smart” fountain network and the bottled water industry and ask why the promise of the public drinking fountain—the kind you could access without a phone, without walking into a café—has failed even as Americans drink more water than ever before. During the heyday of municipal water systems, bottled water was considered a low-class product for the unplumbed. But then came bottled water marketing, declining faith in government, and environmental paranoia. All that led to fewer public water fountains, which in turn led to fewer Americans trusting public water fountains. Incredibly, installing a new water fountain can cost New York City into the six figures; installing a Reefill, which piggybacks on the sunk costs of a store, costs a few thousand dollars. And yet: New York City has nearly 2,000 public water fountains. That’s more than the number of Dunkin Donuts, Subway, Starbucks, McDonald’s, Burger King, and 7-Eleven locations combined. That they don’t compete with bottled water—because of their isolated locations, lack of winter operation, and the snobbery of bottled water consumers—should be seen as a public failure that needs fixing. As a New Yorker, I’m already subscribed to that network, and I’d like to see better results.